Take a virtual tour of the delightful and thought-provoking sculptures by Tom Otterness at the 14 St-8 Av subway station in Manhattan, part of MTA Arts for Transit. 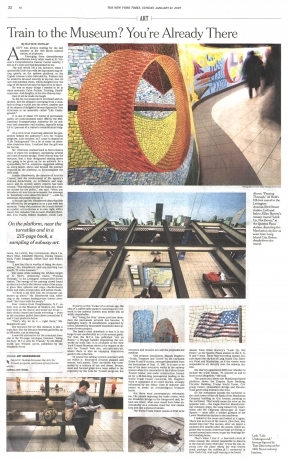 Artist Tom Otterness talks about Life Underground (2001), his sculpture installation at the Fourteenth Street and Eighth Avenue subway station, commissioned by the Metropolitan Transit Authority. This station and artwork will serve as the transportation hub to the Whitney Museum's new building, which will open in the Meatpacking District in 2015.
amNewYork talks to public art sculptor Tom Otterness inside his Brooklyn studio. At the Eighth Avenue subway station, sewer alligators are not an urban legend. 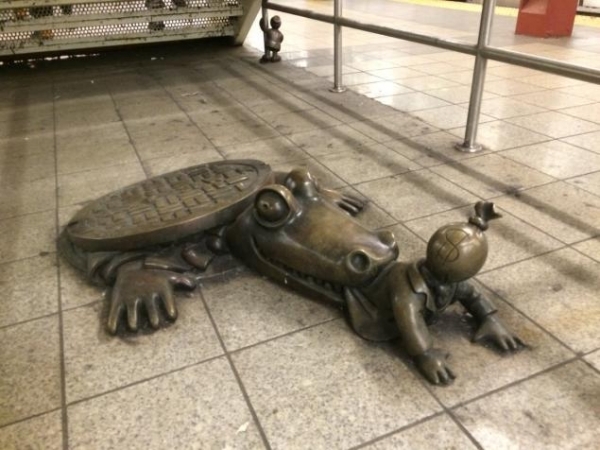 Anyone who’s been through the 14th St./Eighth Ave. station has probably seen the bronze gator sculpture — and probably wondered what it means and why it’s there. Train to the Museum? You're Already There.